Do you have eye or vision problems after Lasik surgery on your eye? Do you have eye or vision problems after Lasik surgery on your eye? Some people have more problems with their eyes after they have Lasik eye surgery than they had before the surgery. These new problems are a great disappointment because, obviously, you got Lasik surgery to improve your vision and now it is much worse. Sometimes, this happens in the absence of medical negligence. But, far too often today when unqualified doctors are tripping over each other to fight for this lucrative business, a medical mistake is the cause of failed Lasik surgery. If you developed more eye problems after you had this surgery, you may have a claim for compensation. 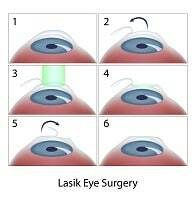 Lasik eye surgery is a surgery performed on the cornea of the eye using a laser. A laser beam is a beam of highly focused light. It can cut some bodily tissues like a very small, very sharp knife. The cornea is the clear tissue that covers the pupil of the eye. Light passes through the cornea to the retina, which is how we see. When the cornea is not the right shape, the passage of the light through the eye is distorted. The light is not focused properly on the retina of the eye, and the person's vision is impaired. In Lasik surgery, the doctor makes a little incision in the cornea so that he or she can lift up a small flap of the clear tissue. Then, a laser beam reshapes the corneal tissue under the flap. The doctor replaces the flap. If all goes well, the cornea heals quickly, and the patient’s vision is improved. What are some of the possible adverse consequences of Lasik surgery? Many people will still need glasses or contacts after the surgery; a patient’s vision will not necessarily be 20/20. These doctors and hospitals, fighting for the money that can be earned from these procedures, often imply - usually indirectly but sometimes directly - that every patient will be able to see clearly without glasses after the surgery. While this is relatively awful, these claims are not the basis for medical malpractice cases. These are known risks of the surgery that usually occur in the absence of a medical error. The surgical changes in the cornea can affect people’s vision in adverse ways. Some patients experience a worsening of their vision, which cannot be corrected later. Some people see halos around objects or have double vision. Others have problems driving at night. These problems can be debilitating even if daytime vision is clearer. The surgery can also affect the eye itself. For example, some people’s eyes become too dry after the surgery so that they have to use artificial tears to moisten the surface of the eye. One of the most serious adverse consequences of laser surgery is keratoconus. In this disorder, the cornea changes shape and bulges outward. This causes vision to deteriorate. For example, some people with this problem see “ghost images” – shadowy double vision -- of objects that they are looking at. Keratoconus is sometimes treated by having a patient wear two pairs of contact lenses at once. Some patients require more surgery or even a corneal transplant. However, keratoconus occurs in people who do not have Lasik surgery. 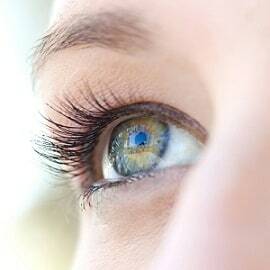 Some older patients have a variation on Lasik surgery in which each eye is altered in a different way so that one eye sees things at a distance clearly and the other sees things close up clearly. The idea is that the patient’s brain can decide what it wants to see clearly and use the vision in the appropriate eye. Some people never adapt successfully to this form of surgery and cannot tolerate having permanently blurred vision in one eye. Are there health factors that increase the risks of surgery? Diabetes is risk factor for most surgical procedures, regrettably, including Lasik eye surgery. Some characteristics of the eye also increase the risk of the surgery not turning out well. For example, wearing hard or soft contact lenses before the surgery can delay the healing process after the surgery. Patients who wear contacts should be advised to discontinue wearing them for days or weeks before the surgery. The success of eye surgery varies depending on the particular vision problem that a person has. Laser surgery is more successful for some vision problems than for others, and the proper laser must be used for each type of vision problem. For example, not all surgical lasers are suitable for correcting astigmatism. Below are some plaintiffs' verdict in Lasik eye malpractice cases. These cases were not selected as fair sampling of these cases and should not be used to presume the value of your case. Still, they give insight into the type of Lasiksurgical error cases that are treated favorably by juries. 2015: Massachusetts. A 50-year-old male plaintiff went to an ophthalmologist for laser surgery to correct his vision. But the plaintiff had pellucid marginal degeneration which eliminates surgery as an option. The case settled before trial for $600,000 in spite of relatively limited injuries (some vision loss and the need for rigid gas permeable contact lens). 2012: California. Plaintiff, a 32 year old certified nursing assistant undergoes LASIK eye surgery at a TLC Laser Eye Center. The surgeon is assisted by two employees, one of whom is a laser technician responsible for downloading the treatment into the laser device and confirming the patient identity/treatment throughout the procedure. Before the surgery, however, the laser technician downloads another patient’s treatment plan into the laser resulting in three to four times more corneal tissue being removed from Plaintiff’s eyes than intended. Plaintiff sues the surgery center, surgeon, and technician, as well as a few other entities. Plaintiff later amends the Complaint adding products liability claims against several manufacturers including the laser manufacturer and the manufacturer of the USB flash drive that houses patients’ treatment plans. Plaintiff claims that her vision is worse than before the LASIK surgery, and that she experiences eye dryness requiring prescription and over-the-counter eye drops. She additionally suffers blurriness, glare, sensitivity to light, shadowing, starbursts, and headaches. Defense concedes that the laser treatment caused more high order aberrations, but argues that any decrease in quality of vision was minimal and supported only by Plaintiff’s subjective descriptions. Plaintiff is awarded $8,911 for past medical costs, $198,193 for future medical costs, $300,000 in past pain and suffering, and $50,000 for future pain and suffering (approximately $550,000). The award is reduced by $20,000 for a pretrial settlement with one of the manufactures, and further reduced under California law with regard to non-economic damages. The award entered against the Laser Eye Care of California is $229,004.43. 2012: Illinois. Plaintiff, a 37 year-old saleswoman, has Lasik surgery at a mall (probably a bad sign, right?) in Schaumburg, Illinois. This is her second Lasik procedure. The doctor recommended an enhancement procedure to restore her visual acuity. To do this, the doctor had to either re-lift the flap from her previous cut or make a new cut. The doctor could also, accordingly to plaintiff's lawsuit, perform a PFK which would not require a flap. The doctor instead does another cut because he could not find the old one. The resulting scar and cut causes complication although her vision is somewhat restored. Plaintiffs claim the doctor should have done the PFK and that the informed consent agreement should have lead the doctor to stop the procedure when he could not find the old cut. Plaintiff's counsel asked for $2 million. The jury awarded $362,000 to the plaintiff and her husband. 2009: New York. The plaintiff, a pharmacist, gets Lasix eye surgery and develops post-Lasik ectasia which is a progressive thinning of the cornea. Ectasia causes a mess of problems with your vision and can be painful. Doctors did not understand ectasia when they started doing these surgeries. If you have a Ectatic corena, as this man obviously did, you should not get Lasik surgery. The doctor in this case argued this is a rare side effect (1 in 2,500), and this patient was not a high risk or unsuitable candidate for Lasik based on what was known to the doctor at the time of the procedure. In other words, he could not see that the corena was thin. After a ten day trial, the jury disagreed and awarded the man $5,600,000. Why no Maryland verdicts? There simply have not been many. There was a defense verdict in 2003 and 2004. But not many of these cases have gone to trial in Maryland, for whatever reason. Of course, this does not include confidential settlements that are never reported. In malpractice cases, the best cases almost invariably settle. Our lawyers can evaluate your situation to see if you have a valid claim. Two kinds of claims can arise from Lasik surgery that goes wrong. The first kind of claim is where the patient did not understand the risks of the surgery before he or she decided to have it (the Illinois case above). Doctors have a legal duty to provide their patients with adequate information about the risks and benefits of any medical procedure. That is so that patients can make an informed decision. The second, and more common, is the kind of claim where something goes wrong during or after the surgery. Sometimes the things that go wrong are just an unfortunate happening. Sometimes they are caused by the doctor’s negligence. Our lawyers can help you sort out what really happened to you.... and why. What Do You Need to Know to Evaluate My Claim? When did you have your eye surgery? How has your vision worsened since the surgery? Do you have other new problems with your eyes? What risks of the surgery did your doctor explain to you before the surgery? Did your doctor recommend a second surgery? Did you have the second surgery? Did it correct the problems? If you live in the Baltimore Washington area and believe you have been a victim of a medical error in a Lasik case, call 800-553-8082 or get a free online medical malpractice consultation.